Chamber music for voice, piano and woodwinds by Schubert, Schafer, Cooke and Laitman; with mezzo-soprano Patricia Green, soprano Bethany Hörst, and Marianna Chibotar-Rutkevich, piano; Derek Conrod, horn; Ron George, horn; Shelley Heron, oboe; Marie Johnson, clarinet; Sharon Kahan, flute; Bobbi Thompson, saxophone; and Alexandre von Wartburg, bassoon. 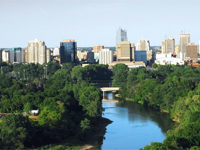 Many of our stellar faculty perform regularly around the world, in addition to London, Ontario. The Faculty Concert Series presents these exceptional musicians in chamber programs. Faculty artists collaborate with both guest performers and students from Western. The Faculty Concert Series (October 21, November 11, January 20) is sponsored by the Dean's Office and Western's Office of the Provost.